Located at 301 Airport Road in North Aurora, Cherry Logistics provides expert service in facilities maintenance. Since the business understands that clients prefer a one-stop-shop approach, it specializes in lighting maintenance, landscaping, lot care, snow removal and heating as well as air conditioning services. 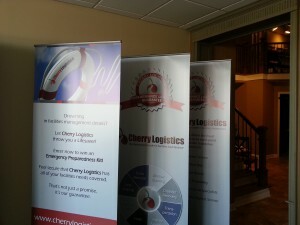 When it came time to increase the company’s visibility, Cherry Logistics contacted Mark Your Space for assistance. We discussed the branding needs with the management team and discovered that the company was looking to add retractable stands for North Aurora, IL, marketing purposes. These banner stands are quick and easy to set up, offer plenty of marketing space and are on the cutting edge of trade show as well as reception area advertising. We incorporated the company’s name, logo and several graphics from the business’ website. The text includes a breakdown of services as well as the customer satisfaction guarantee that puts Cherry Logistics in a league of its own. 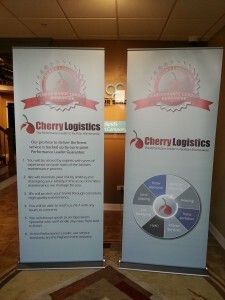 Instructive retractable banner stands for Chicago-area businesses are always a good idea. The combination of the logos and written information informs while its brands. Name recognition is easy to achieve – particularly because some of the imagery is identical to what consumers find on the website. How can this help your company this year? Interact with potential customers from the start. Even before a representative has had a chance to meet with the client and present your company’s services, retractable banner stands start the business relationship off on the right foot. They give you the space necessary to highlight popular services and differentiate yourself from the competition in the process. Add to your trade show presentations. Each year, updated service descriptions and product details make your business stand out. 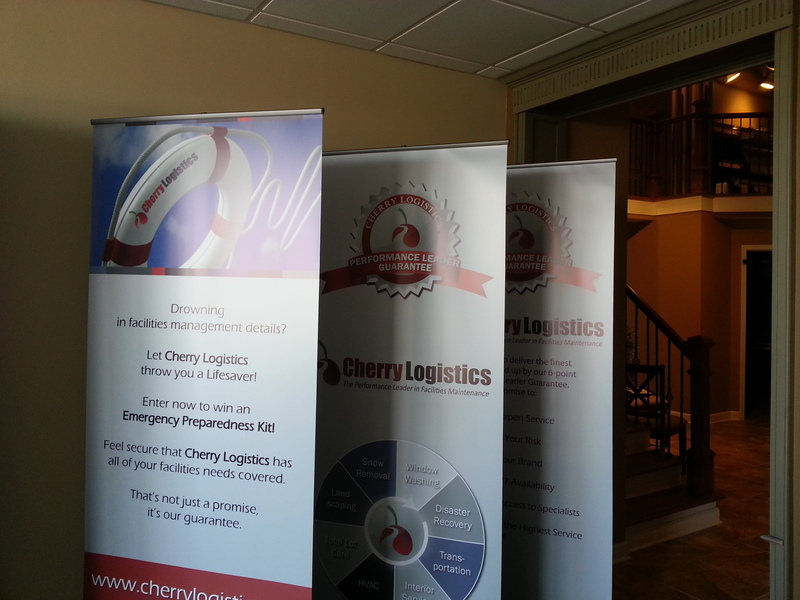 If you intend to participate in one or more trade shows, it is a good idea to have these banners ready to go. Even if you are not currently planning on exhibiting your company’s products or services, remember that some of the best opportunities crop up suddenly! Being prepared lets you take advantage of presentation opportunities as they arise. Turn a reception area into a marketing office. A large reception area might be a great status symbol for a law firm, but for another business it can quickly turn into a wasted space where clients feel slightly uncomfortable. Turn your lobby into a marketing office with little more than a few well-placed banners that also help to break up the space. Set the tone for a buying decision. When consumers visit your office, you already know that they have some interest in your product or service. Informative banners start the sales conversation that informs about payment options and incentives. Of course, there are also aesthetic elements of placing banners in your office. 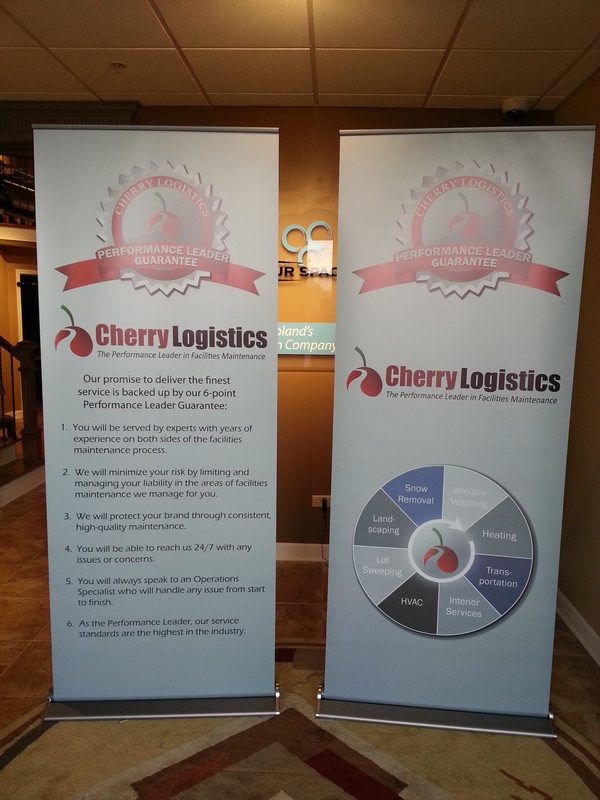 Integrate your logo and company name via these banners into the overall décor of the setting. Our friendly banner stands experts can give you some great pointers on how to use these displays in the foreground, background or somewhere in between for the best results.